The window system in the Rhino-600 consists of a large front panel of solid fabric sewn at the bottom with silent hook and loop attachments on the sides and top. The roomy rear windows are attached by a silent hook and loop system for easy adjustment. STRUCTURAL INTEGRITY - Rhino Blinds are built tough and designed to with stand the pressure of collapsible hubs, without stretching or rods breaking. 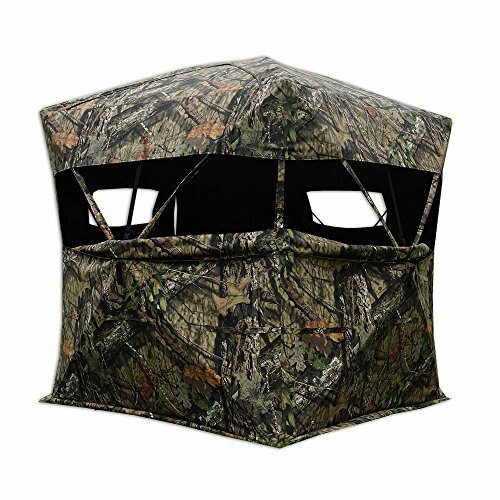 DURABLE FABRIC - The Rhino MOC-102 blind is constructed of a True 600 denier polyester. This means the fabric is 600 denier thread in both the horizontal and vertical weave. FACTORY TREATED UV BLOCKER - Rhino Blinds are treated at the factory to kill the Blue White Glow caused by optical brighteners applied in the printing process which are easily seen by game animals and birds on untreated blinds. If you have any questions about this product by Team Rhino Outdoors, contact us by completing and submitting the form below. If you are looking for a specif part number, please include it with your message.